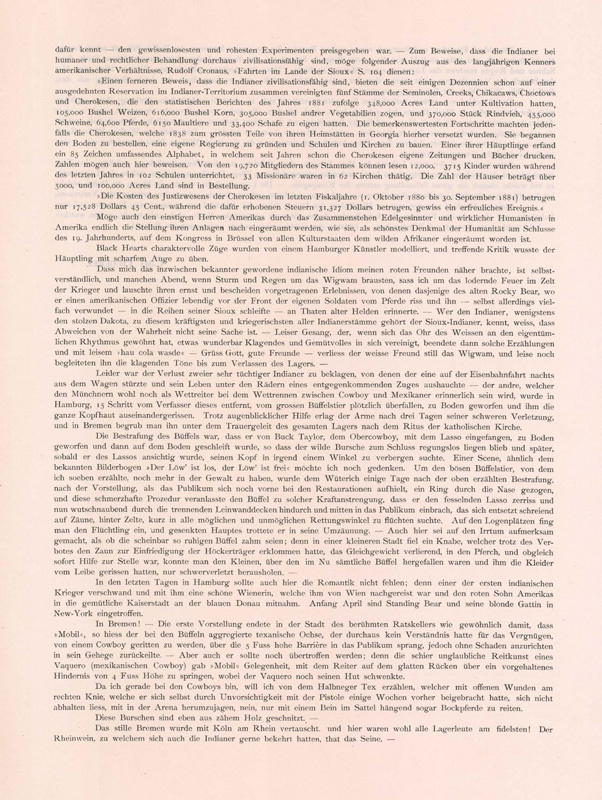 Veröffentlicht in den Münchner Neuesten Nachrichten, April 1891. Colonel Cody (Buffalo Bill) showed me the kindness of allowing me to visit his camp daily during his stay in Munich and to accompany him in my capacity as a painter during his travels through Germany. I gladly dedicate these lines to him and his troupe in friendly remembrance. My first acquaintance in the camp in Munich was Broncho Bill,  a white interpreter, and his Indian wife, the only Indian female in the camp and, incidentally, an attractive woman. Their young daughter was the joy of all the women. Their son, Little Benny — a dashing rider at the age of nine — was already very independent. The best example was that the little cowboy kept the bank now and then for the cowboys and Indians; Little Benny sitting on a table in a tent, gold and cards in front of him, serving as banker, and the seven-foot tall King of the Cowboys as his partner — that was a rare picture. Broncho Bill, who had come to the Sioux as a young boy and had learned their language and been raised by them, introduced me to Rocky Bear, the chief, and his tent mates. My pencil was our first interpreter, as drawings substituted for the words I lacked. The chief repeatedly assured me that they all liked Munich best. If the afternoon performances were, of course, most interesting to the painter, the time that the camp was closed to the public also offered much that was noteworthy. It was a serious-comic scene as the giant Buck Taylor teased one of the most mean spirited bronchos with a switch. 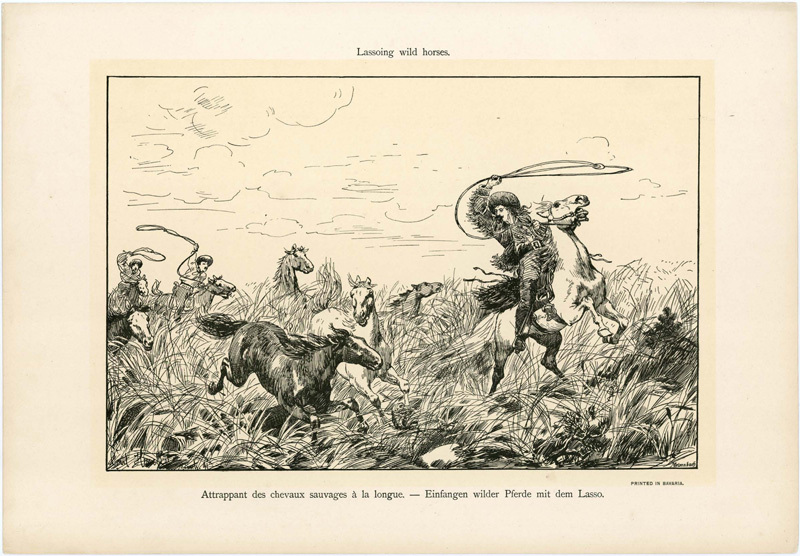 The animal tore itself loose from the bridle and, up on its hind legs and ears raised, attacked the King of the Cowboys so energetically that His Majesty of the Wild West took mighty leaps across the wet ground and fell head over heels into an Indian tent. Another cowboy, who had in the meantime leapt upon his horse, quieted down the gray horse with his lasso. 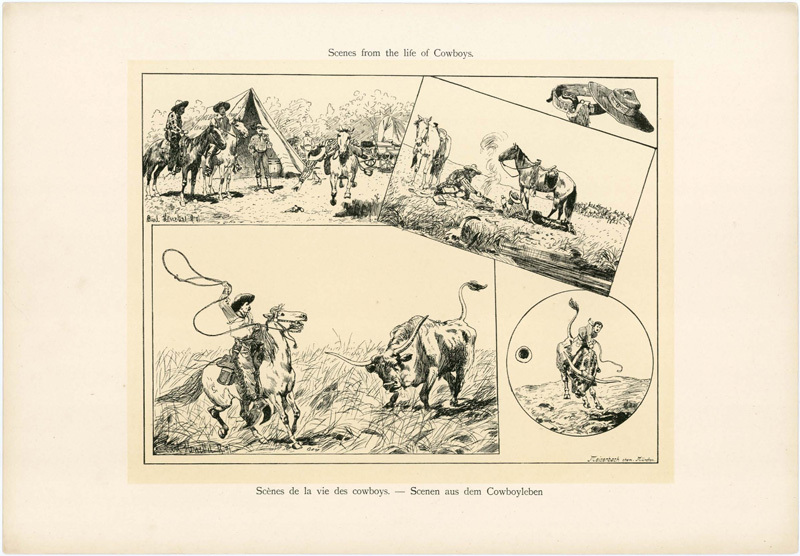 That bronchos—so often incorrectly depicted as bridled (mostly, though, by individuals who do not ride)—are not to be toyed with, the author of these lines had to learn for himself; and the fact that, in the span of one week in Berlin, three cowboys were taken from the scene with broken limbs demonstrates clearly enough the danger of broncho riding. The complete submission that comes as soon as the animal feels the lasso stems from fear of the same. The giant buffalo also later learned to share that fear after it had been made acquainted with the lasso, as we will see below. The friendly Major Burke, the manager of the troupe — who has a giant scar dividing one half of his face in two inflicted by an Indian ax blow that he received in a fight during the great Indian War — made me known around the camp. After my visit with Miss Oakley, that most friendly artist of marksmanship, and with Mr Daci,  the sender of deadly bullets (who, incidentally, had earlier pursued the less dangerous profession of photography in New York), I was soon at home in the camp, and it was all the more gladly that I accepted the commission from Colonel Cody to serve him as artist and to accompany his troupe. In Dresden, the co-founder of the Wild West company, Mr. Nate Salsbury, a dramatic actor esteemed in America and England who had brought the enterprise in to existence with Colonel Cody, arrived. He was in charge of business matters and was director of the whole operation. I have his friendly cooperation, too, to thank for many pleasant hours. If the visit to Munich was a great success, the visits to other cities surpassed that considerably. In pouring rain, for example, the show was almost always sold out — even during such a storm in Stuttgart that the giant mess tent collapsed. Despite the friendly reception on the part of the populace of Dresden, it was of Munich that the Wild West folk had fondest memories. On many evenings, even the taciturn Red Skins spoke of the good friends and good beer (mine piga, or "yellow water") in Munich. Just as they went into raptures about Munich as a city, the much- and far-travelled white and colored members of the Wild West troupe spoke passionately about Germany as a country. It would have taken little persuasion for a small Buffalo Bill colony to settle for the winter near a brewery in Munich. The show's location in Berlin was the best imaginable place for the display of the entire scene. The tent encampment, between tall trees or hidden in the bushes, and the giant arena, with a massive tree in the center and electrically illuminated at night, presented beautiful pictures! 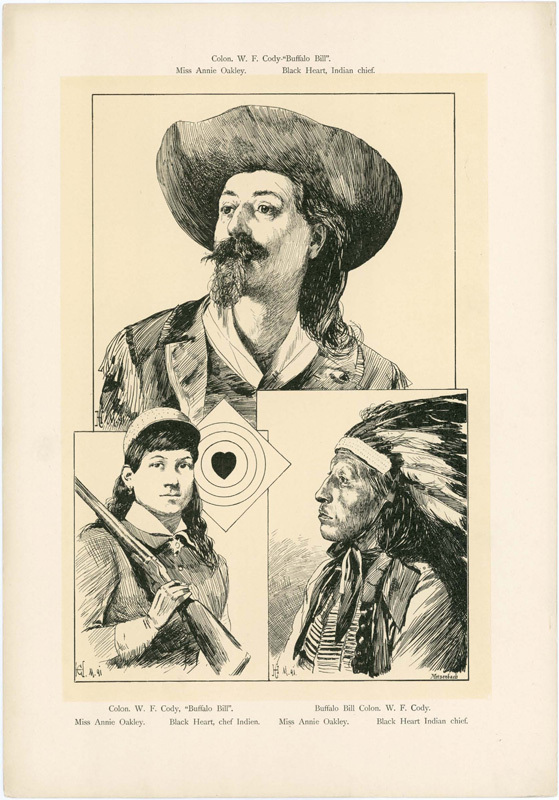 The audience often drew parallels between Buffalo Bill and the small copy-cat troupe of Dr. Carver,  which had performed in Berlin a few months earlier. I often spent the pleasant summer nights in the camp in conversation with my Indian friends, the Cheyenne Chief Black Heart — one of the most refined Indians, he can trace his lineage back to the beginning of the previous century — and William Pinaud, the Indian interpreter, whose English was extraordinarily strong and who, like most Indians, can read and write. The Indians make use of the Latin alphabet in their correspondence and almost without exception write with beautiful, clear hand. The third member of the group was the aged John Nelson, a trapper at least 70 years old. People in Munich probably still remember him from the old mail coach, which, sitting on the roof, he defended against the Indians with vigorous gestures. Our Nelson lived for at least 40 years among the Indians. He often shed a silent tear for his wife, who died a few years ago, when her name came up in conversation. The daughter of an Indian chief, she had been known for her grace and beauty. She had presented him with four children, each pretty as a picture. The youngest, a 15-year-old boy, was one of the best riders in the camp. How this white man had loved his Indian wife! Sha-sha-sha o poges — Indian for The One Shot Three Times — so the old Nelson was known to the Sioux. A hostile Indian had once honored him with a bullet that passed through his right hand and left forearm and finally lodged itself in his nose. After it had resided there three years, he sneezed it out one day! With these three friends I often went to the theater, to concerts, and, in particular, to museums. The last always aroused the greatest interest in them. When Black Heart  recognized objects from his tribe among the embroidered works and drawings in the Indian department of the Ethnographic Museum in Berlin, his pride was great. William Pinaud declared the collection the best he had seen up to then. Almost all Indians have a love of music. I was extremely surprised one morning to find Black Fox,  the Indian dance leader, sitting in his tent and playing Heil Dir im Siegeskranz and other well-known melodies by ear on a concertina. Related to this penchant [for music] is the penchant for painting. 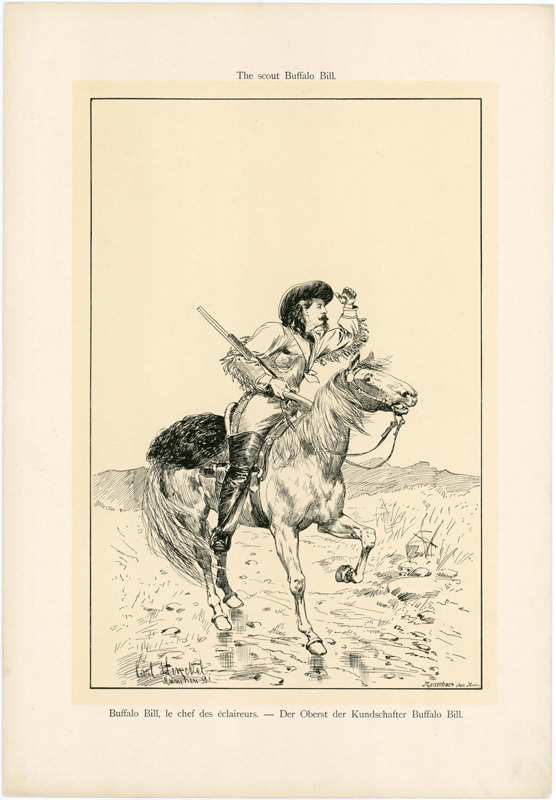 The fighting buffalos by Black Heart, which can truly be called artistically perceived, and the drawings by Rocky Bear  depicting himself and his deeds, likewise in the author's possession, bear eloquent witness to their talent. In Berlin, "Little Chief"  — probably the most physically attractive of the Indians, with a head that, skin color aside, would be an ornament to any European — left the camp on account of a telegram telling him to return home. His elegant civilian clothing and massive soft hat looked as handsome on him as his impressive Indian chief's outfit. An Indian Don Juan, he left behind many tear-filled eyes! Mention should be made of the open-air religious service held in the camp on Sunday mornings. The mostly Catholic Indians attend with great devotion. 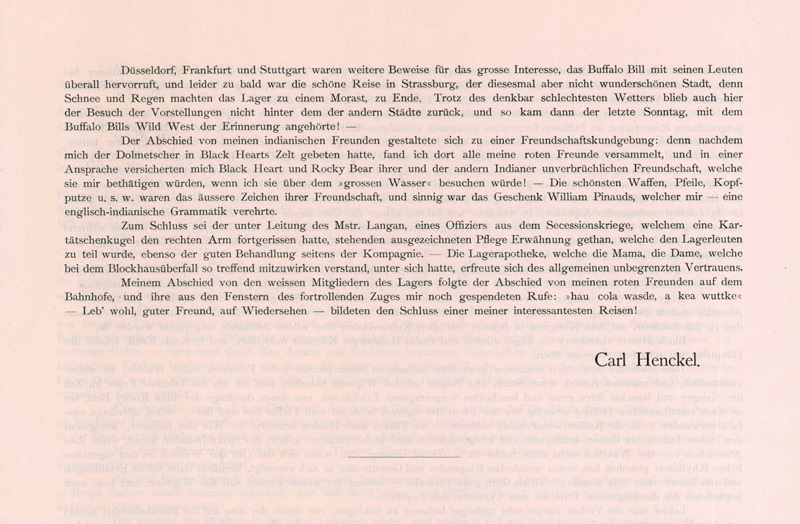 It was with a heavy heart that we went from Berlin to Hamburg, where the competing, imitation troupe of Dr. Carver challenged Buffalo Bill's company to a competition! 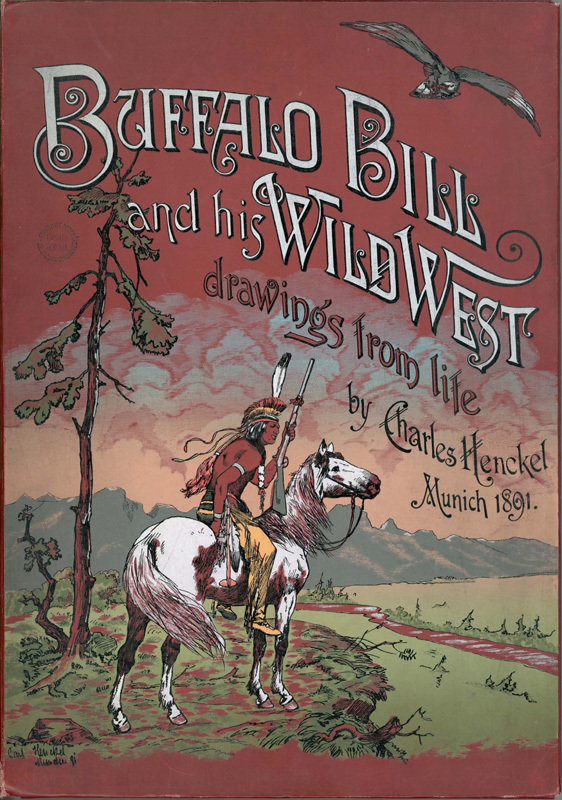 The Buffalo Bill performances drew an enormous audience and "sold out" daily. The greetings between the two groups of Indians were highly interesting. There was no end to reciprocal visits, festive dinners, speeches — in short, just as things are with us! Further proof that the Indians are capable of civilization is provided by the five tribes  of the Seminoles, Creeks, Chickasaws, Choctaws, and Cherokees, who have been united together in an extensive reservation in Indian Territory for a few decades. According to the statistical reports for the year 1881, they had 348,000 acres of land under cultivation, produced 105,000 bushels of wheat, 616,000 bushels of corn, and 305,000 bushels of other produce and had 370,000 head of cattle, 455,000 pigs, 64,600 horses, 6,150 mules, and 33,400 sheep of their own. The Cherokees, most of whom were moved there from their home lands in Georgia in 1838, have made the most remarkable progress. They began cultivating the soil, founded their own government, and built schools and churches. One of their chiefs invented an 85-character alphabet, which the Cherokees have been using to publish their own newspapers and books for many years. Numbers can also serve as evidence here. Of the 19,720 members of the tribe, 12,000 can read. During the previous year, 3,715 children were educated in 102 schools, and 33 missionaries were active in 62 churches. The number of houses stands at over 5,000, and 100,000 acres of land are under cultivation. The justice system of the Cherokees cost only 17,528 dollars and 45 cents in the last fiscal year (October 1, 1880—September 30, 1881), while the taxes levied for that purpose yielded 31,327 dollars — certainly a welcome event. Through the help of noble-minded and true humanists, may the former masters of America finally be granted the position they deserve according to their disposition, just as the cultured countries did for the wild Africans as a beautiful memorial to humanity at the end of the 19th century at the Congress of Brussels. Black Heart's character-rich features were sculpted by a Hamburg artist, and, with a sharp eye, the chief knew how to give criticism that was to the point. It was natural, of course, that I grew closer to my red friends as I became more familiar with the Indian idiom. Many evenings, as storms and rain howled outside the wigwam, I sat around the blazing fire in the warriors' tent and listened to their stories of their experiences, told seriously and modestly. One of those recalling the deeds of old heroes was Rocky Bear. Although having been wounded multiple times, he tore an American officer from his horse at the front line of the officer's own troops and dragged him into the Sioux ranks. Those who know the Indians — or at least the proud Dakota, who belong to the Sioux, this most powerful and most war-like of all Indian tribes — know that deviating from the truth is not their way. Such stories end with soft singing that, once the white ear has become accustomed to the peculiar rhythm, marvelously unites the mournful and the sentimental, and with a soft hau cola wasde — "Farewell, good friend" — the white friend quietly leaves the wigwam, and the mournful sounds softly accompany him until he leaves the camp. Unfortunately, we had to mourn the loss of two very able Indians. One fell from the train one night during a trip by rail and lost his life under the wheels of an oncoming train. The other, whom people in Munich will probably still remember as one of the riders in the race between cowboys and Mexicans, was suddenly attacked, only fifteen steps from the author of these lines, by a giant buffalo and thrown to the ground; his entire scalp was torn off. Although he received aid at once, the poor man died from his serious injury three days later. He was buried in Bremen according to Catholic rites, accompanied by the entire camp in his funeral procession. The buffalo was punished: Buck Taylor, the head cowboy, lassoed it, threw it to the ground, and then dragged the wild creature until it was motionless. Later, as soon as it saw the lasso, it attempted to turn away and hide its head in every way possible. 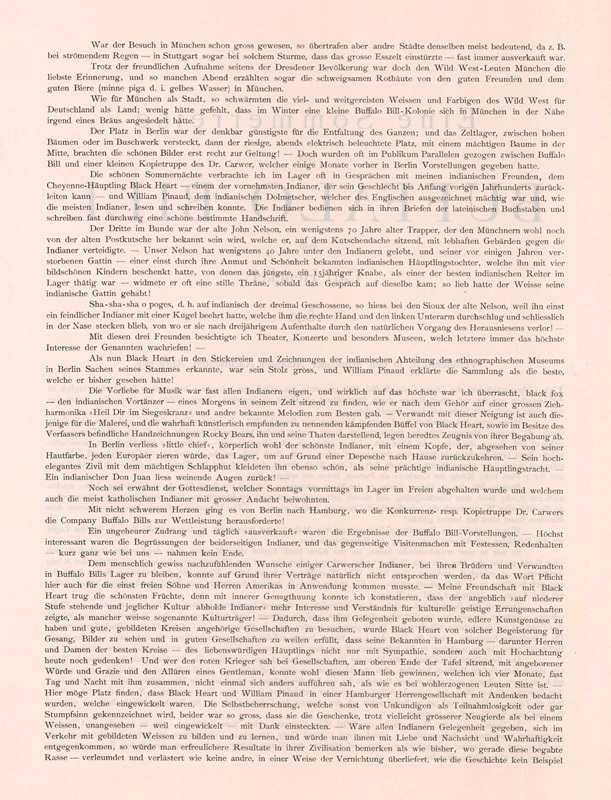 Likewise, I would like to recall a scene similar to the well-known broadside Der Löw' ist los, der Löw' ist frei [The lion is loose, the lion is free]. To bring the evil-tempered buffalo I just mentioned under further control, a ring was put through the brute's nose a few days after the punishment described above, after the performance as the audience was still in front by the restaurants. The painful procedure moved the buffalo to such violent exertions that it tore the lasso restraining it and, snorting with rage, broke through the canvas coverings to the center of the crowd, which screamed in horror and sought refuge on the fences, behind the tents, in every possible (and impossible) corner. The escapee was finally constrained in the box seats and, hanging its head down, trotted back to the enclosure. It should be pointed out here that it is an error to think that buffalo, seemingly so calm, are tame. In one of the smaller cities, a boy, breaking the rules, climbed the fence enclosing the humped animals, lost his balance, and fell into the pen. Although help was immediately on the spot, the boy — all the buffalo having fallen upon him in an instant and torn away the clothing from his body — could only be rescued with serious injuries. Romance was not lacking in the final days in Hamburg. One of the top Indian warriors disappeared and along with him a beautiful Viennese woman, who had followed him from Vienna and [then] took him with her to the homey imperial city on the Blue Danube. Standing Bear and his blonde bride arrived in New York in early April. In Bremen! 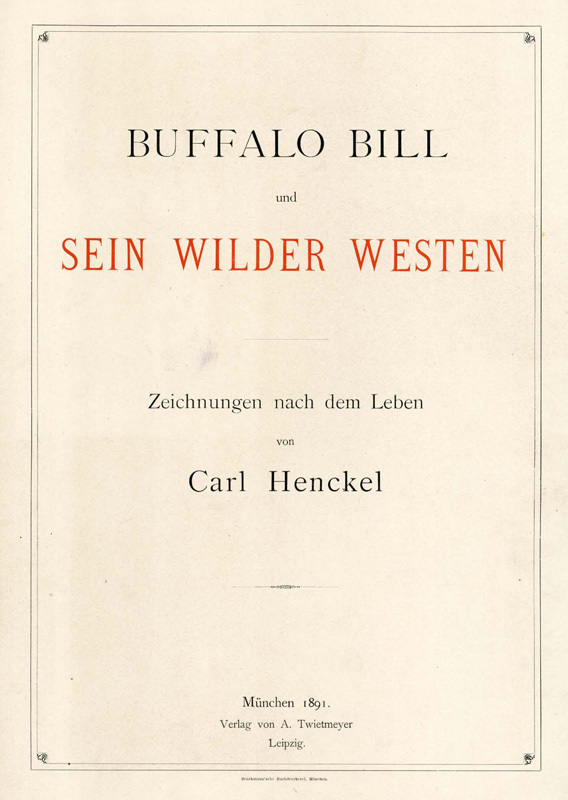 The first performance in the city of the famous Ratskeller ended as usual: Mobil, a Texas oxen kept with the buffalo, showed absolutely no understanding for the pleasure of being ridden by a cowboy and jumped over a five-foot high barrier into the audience but hurried back to his enclosure without causing any damage. But he surpassed himself even more; the simply unbelievable riding skill of a Vaquero (Mexican cowboy) gave Mobil the opportunity to jump over a four-foot barrier with the Vaquero — waving his hat — on his bare back. As I am on the subject of the cowboys, I would like to tell of the mulatto Tex. An open wound on his right knee, which he had inflicted on himself a few weeks earlier by his carelessness with a pistol, did not keep him from racing around in the arena. Indeed hanging on to the saddle with only one leg, he even rode bronchos. These fellows are carved from tough wood. Quiet Bremen was traded for Cologne on the Rhine, and here all the members of the camp were at their most merry. It was the Rhine wine, which made converts of the Indians too, that did the job. 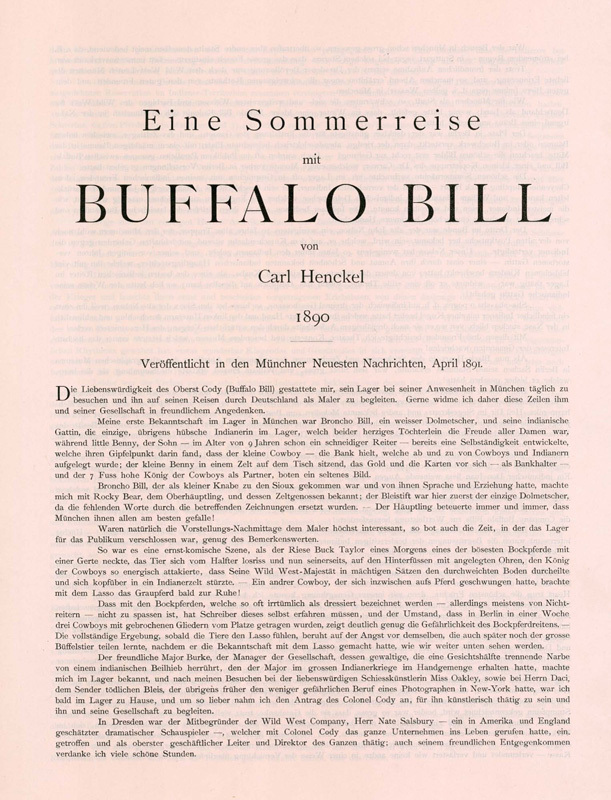 Düsseldorf, Frankfurt, and Stuttgart were further proof of the tremendous interest that Buffalo Bill and his troupe aroused everywhere. Unfortunately, the trip came to an end, too soon, in Strasburg, this time not a beautiful city as snow and rain turned the camp into a morass. Despite the worst weather imaginable, here, too, the numbers of people attending the performances did not decrease compared to those of the other cities. And thus the final Sunday arrived, and Buffalo Bill's Wild West became a memory! My leave-taking from my Indian friends took the form of a declaration of friendship. After the interpreter bid me to Black Heart's tent, I found all my red friends gathered there. Black Heart and Rocky Bear assured me in a speech of their and the other Indians' imperishable friendship, which they would show me when I came to visit them across the "big water." The most beautiful weapons, arrows, headpieces, and the like were the external signs of their friendship. The gift that William Pinaud honored me with was apt: an English-Indian grammar book. In closing, I should mention the excellent care the members of the camp received from Mr. Langan, an officer in the American Civil War whose right arm had been torn off by a shotgun blast/grapeshot. The camp pharmacy, run by Mama, the woman who played so effectively in the attack on the log cabin, was trusted absolutely by all. After I had taken my leave from the white members of the camp, I took leave from my red friends at the train station. Their call from the open windows as the train pulled away provided the close to my extremely interesting journey: hau cola wasde, a kea wuttke — Farewell, good friend, until we meet again. The following images serve to illustrate for the interested viewer the characters from the far Wild West of North America and to reproduce scenes from their lives, which present a wonderful mixture of medieval romance and the raw force of nature, and whose traits will soon have disappeared forever in the face of the steady progress of civilization. The proud Indian, robbed of his homeland, as well as the "Trapper" and "Cowboy," who are similar to the Indian in habits, will soon be just a memory, and with them the whole wild romance of the West! 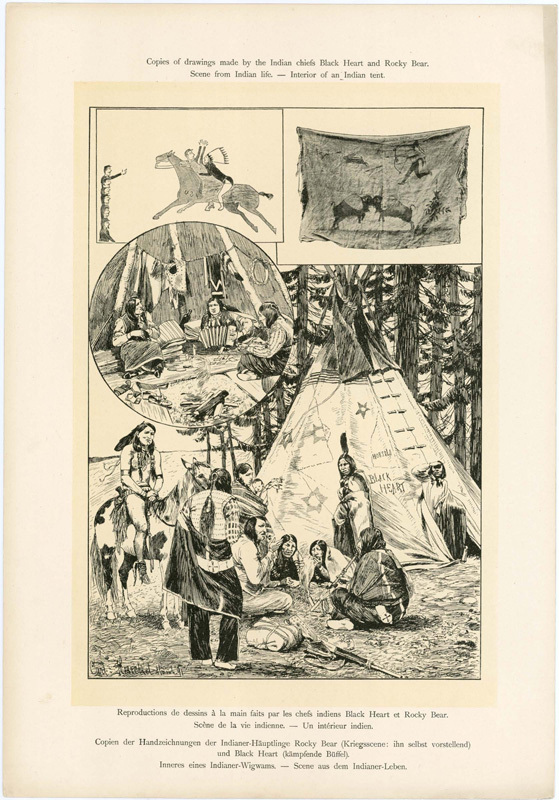 The camp of Buffalo Bill, the famous scout with the real name of Colonel W. F. Cody, offered this author the opportunity, during a six months stay, to study and capture in his drawing portfolio all of the different characters as well as the scenes that now are performed for entertainment but in the past were fought in all their bloody earnest between the whites and the Indians. The entirety of the people, animals, and equipment are drawn from life, as are the scenes that were witnessed, enabling the author to depict characters and scenes taken from real life. May these images be received in that spirit! A Summer Trip with Buffalo Bill. 1. Buffalo Bill, Chief of the Scouts. 2. Sioux Indian Chiefs on the Prairie. 3. 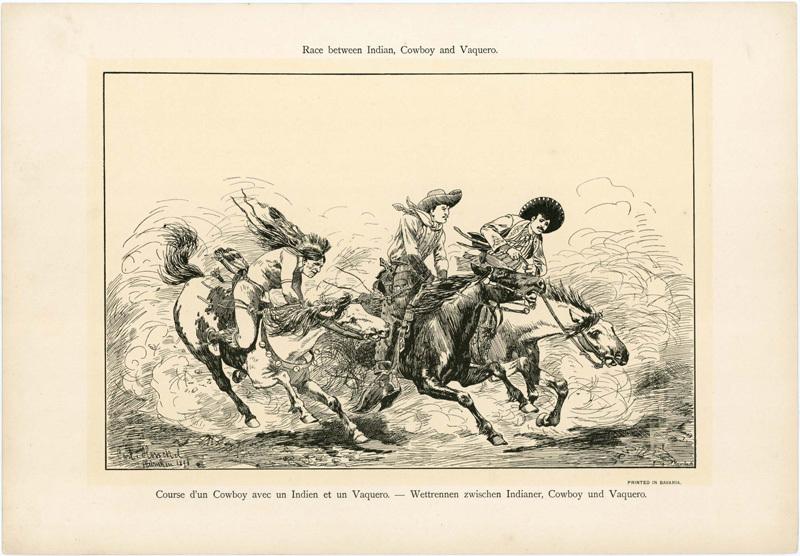 Race between Indian, Cowboy and Vaquero. 4. Immigrant train attacked by Indians. 6. Cowboys riding and taming bucking horses. Shoeing a wild horse. 7. Scenes from the life of Cowboys. 8. 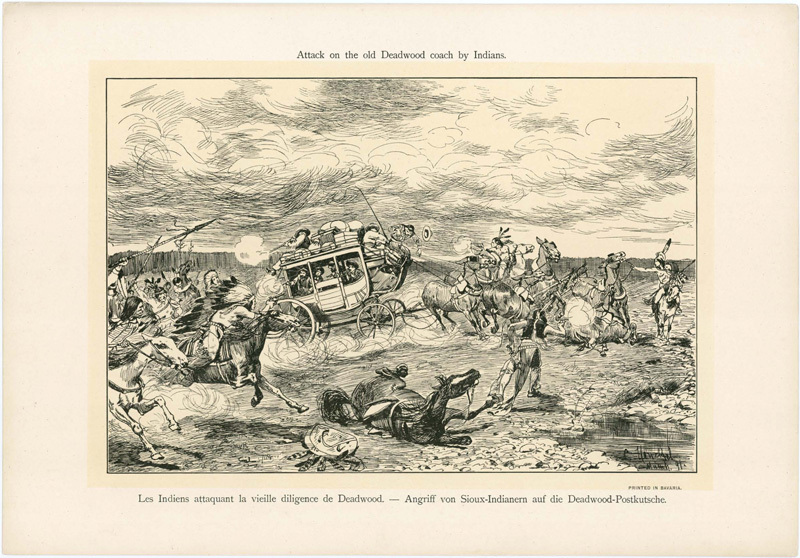 Attack on the old Deadwood coach by Sioux Indians. 10. 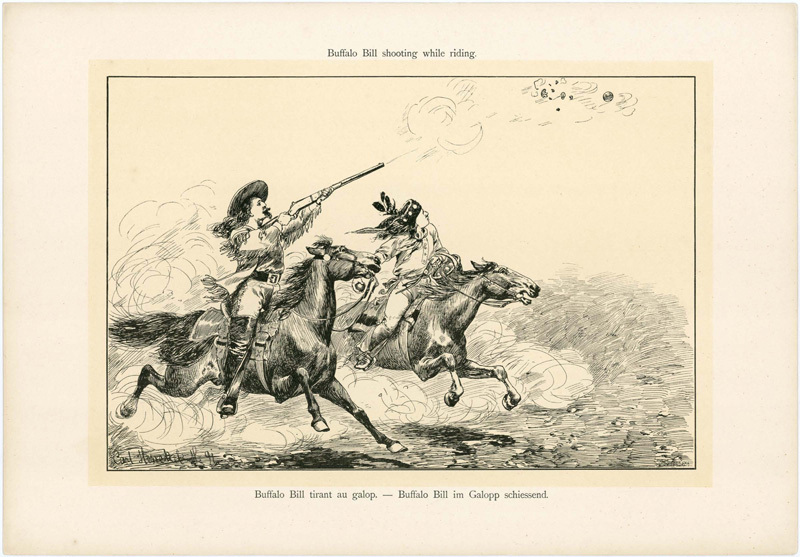 Buffalo Bill shooting while riding. 12. 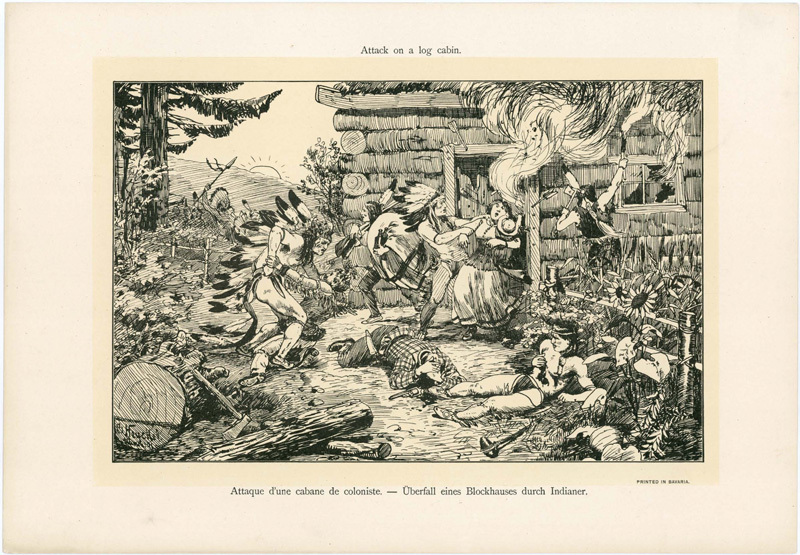 Attack on a log cabin by Indians. 13. Copies of hand drawings made by the Indian chiefs Rocky Bear (war scene: depicting himself) and Black Heart (fighting buffalo). — Interior of an Indian tent. — Scene from Indian life. 14. Portraits: Buffalo Bill Colonel W. F. Cody. — Miss Annie Oaklay. — Black Heart, Indian chief. Buffalo Bill, le chef des éclaireurs. — Der Oberst der Kundschafter Buffalo Bill. Les Indiens sur les plaines de l'Ouest. 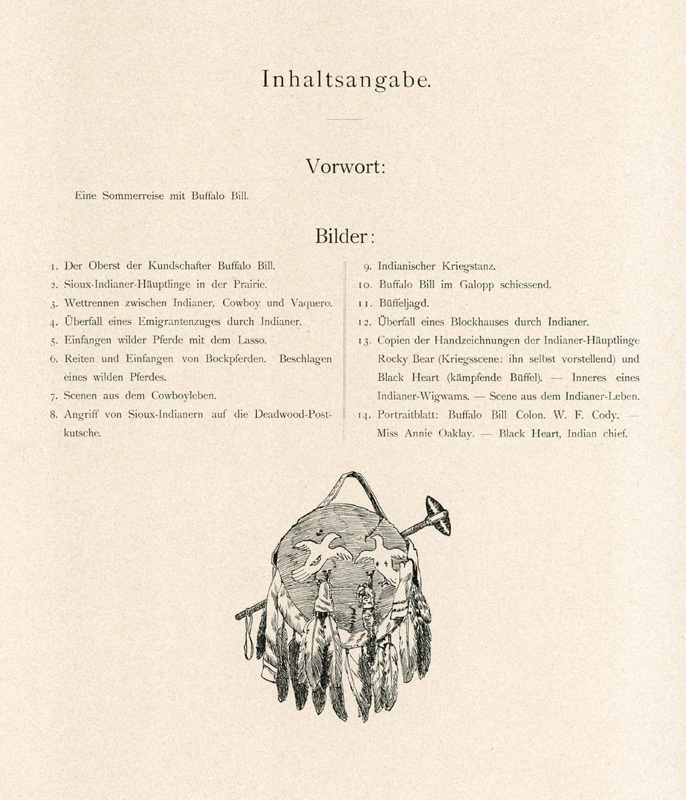 — Sioux-Indianer-Häuptlinge in der Prairie. Race between Indian, Cowboy and Vaquero. Course d'un Cowboy avec un Indien et un Vaquero. 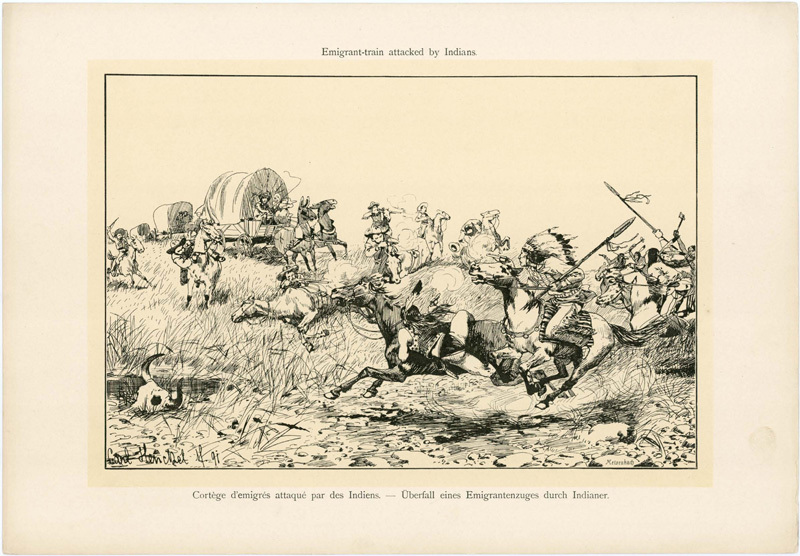 — Wettrennen zwischen Indianer, Cowboy und Vaquero. Cortège d'emigrés attaqué par des Indiens. — Überfall eines Emigrantenzuges durch Indianer. Attrappant des chevaux sauvages à la longue. — Einfangen wilder Pferde mit dem Lasso. 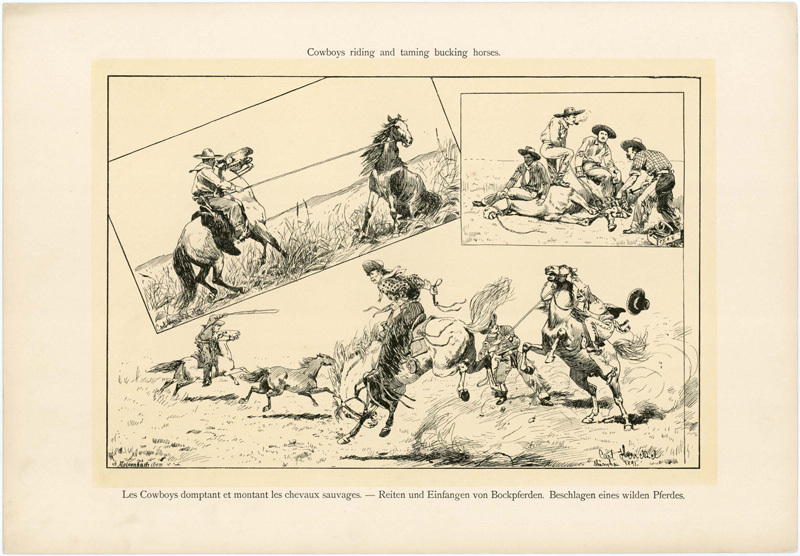 Cowboys riding and taming bucking horses. Les Cowboys domptant et montant les chevaux sauvages. 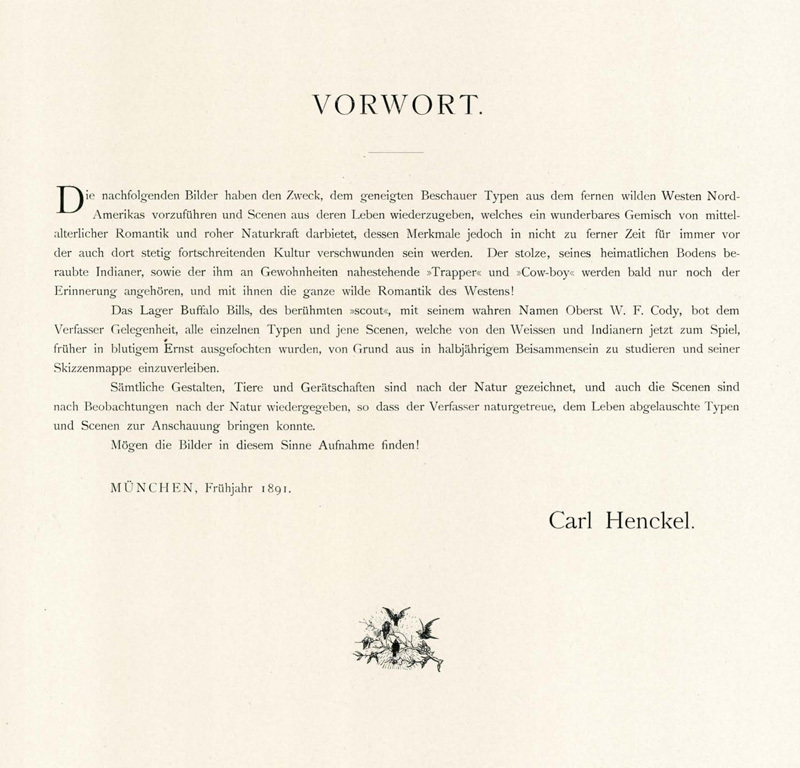 — Reiten und Einfangen von Bockpferden. Beschlagen eines wilden Pferdes. Scenes from the life of Cowboys. Attack on the old Deadwood coach by Indians. Les Indiens attaquant la vieille diligence de Deadwood. — Angriff von Sioux-Indianern auf die Deadwood-Postkutsche. 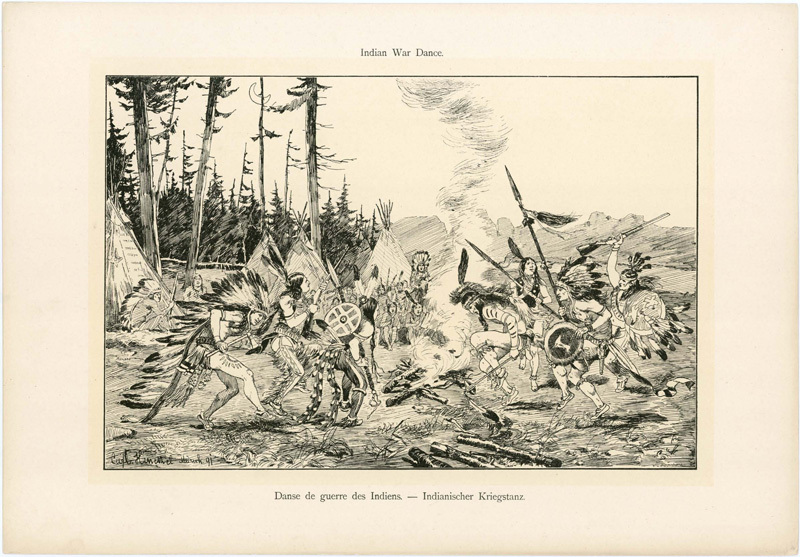 Danse de guerre des Indiens. — Indianischer Kriegstanz. Buffalo Bill shooting while riding. 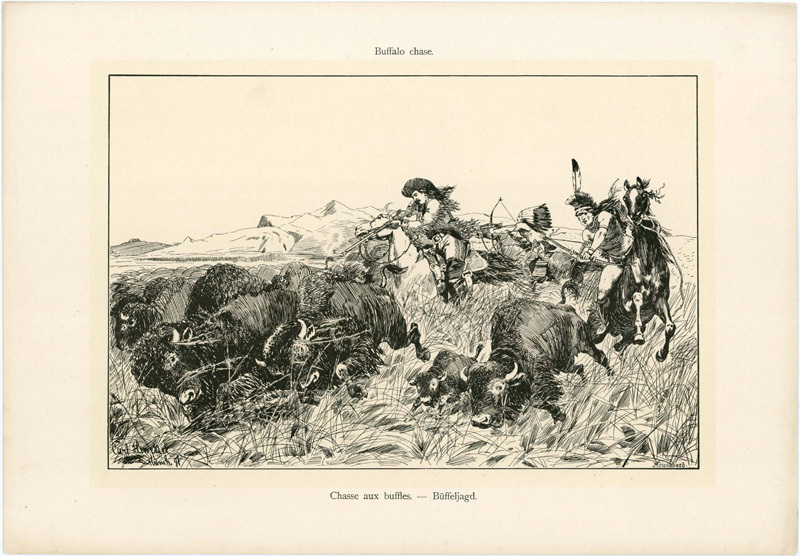 Buffalo Bill tirant au galop. — Buffalo Bill im Galopp schiessend. Chasse aux buffles. — Büffeljagd. Attack on a log cabin. Attaque d'une cabane de coloniste. — Überfall eines Blockhauses durch Indianer. Copies of drawings made by the Indian chiefs Black Heart and Rocky Bear. Scene from Indian life. — Interior of an Indian tent. 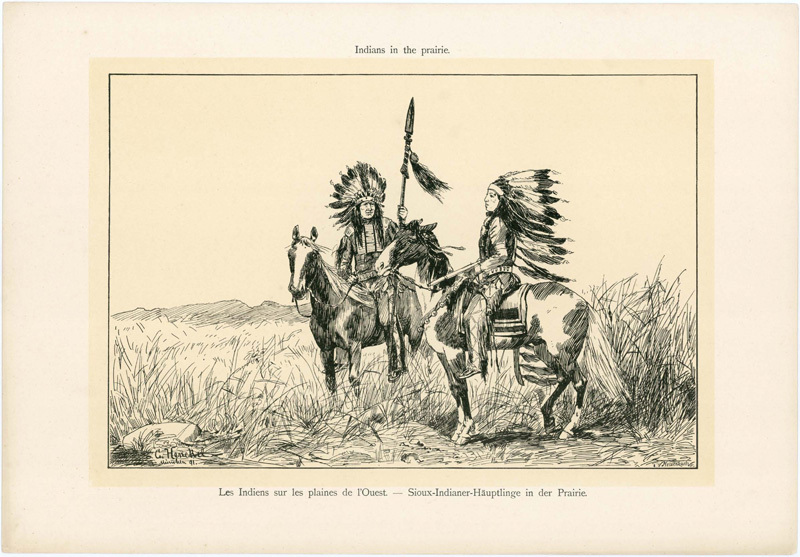 Reproductions de dessins à la main faits par les chefs indiens Black Heart et Rocky Bear. Scène de la vie indienne. — Un intérieur indien. Copien der Handzeichnungen der Indianer-Häuptlinge Rocky Bear (Kriegsscene: ihn selbst vorstellend) und Black Heart (kämpfende Büffel). Inneres eines Indianer-Wigwams. — Scene aus dem Indianer-Leben. Colon. W. F. Cody-"Buffalo Bill". Miss Annie Oakley. Black Heart, Indian chief. Colon. W. F. Cody, "Buffalo Bill". Miss Annie Oakley. Black Heart, chef Indien. Buffalo Bill Colon. W. F. Cody. Miss Annie Oakley. Black Heart Indian chief.